A pregnant queen was terminally ill and the only thing that could cure her was a magical flower. But Gothel (voiced by Donna Murphy), obsessed with reclaiming her youth, kept the flower for herself because it only gave back her good looks for a short time. When the royal soldiers found the flower, the queen was cured and she successfully delivered a baby girl. Villainous Gothel snuck into the castle, discovered that the child absorbed the fantastic properties of the flower, kidnapped her, raised her as her own child, and kept her in a tower for eighteen years. Rapunzel (Mandy Moore) yearned to experience life outside of her home but couldn’t find it to do so because her so-called mother convinced her that the world was dark, selfish, and cruel. Based on the fairy tale of Jacob Grimm and Wilhelm Grimm, “Tangled” was a joy to watch because it radiated positivity but wasn’t afraid to take a dark turn when it needed to. There was a good amount of humor for both kids and adults. 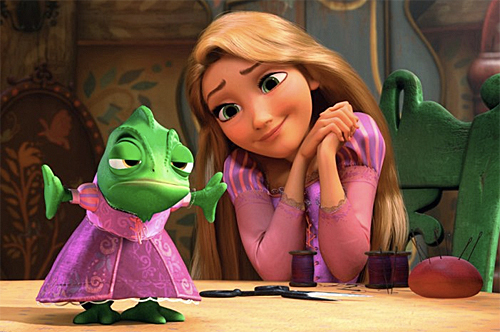 I laughed at Flynn Rider’s (Zachary Levi) vanity, Rapunzel’s purloiner of a prince charming/wanted man. I liked him because he was a different kind of lover that a girl ended up with in most Disney movies. He was modern, almost a parody, but he had good qualities that convinced us that he was a great fit for a girl like Rapunzel. I also enjoyed the chameleon, Rapunzel’s pet and only friend, and the horse determined to catch Rider and his thieving ways. The chameleon and the horse were more than just animals for us to think of as cute. They had human qualities. They were capable of giving begrudging looks, had the tendency to be bossy, and were capable of being sweet. They couldn’t speak, unlike Sebastian the crab in Ron Clements and John Musker’s “The Little Mermaid,” but they didn’t need to. Their facial expressions and body languages said it all. The songs were catchy and they always related to the story. I particularly enjoyed two songs: the time Rapunzel cleaned her house and the visit in the pub full of ruffians. Listen to the lyrics and there was a wink or two aimed directly at our pop culture. The style of animation kept my eyes fixated on the screen. I especially admired the scene in which the characters had to run away from the powerful water after the dam had collapsed. I felt like I was with Rapunzel and Rider when the camera showed the raging water in the background as the duo ran toward us. I mentioned the film having a dark side. It showed Gothel holding a knife. The manner in which she held it with malice suggested murder. There was even a scene in which someone was stabbed in the back. I’m glad that the filmmakers were brave enough to show them. With all kinds of violence featured on television, I think kids of all ages should be able to handle it. “Tangled” wasn’t very deep but it didn’t need to. It just needed to feel magical.